Patricia C. Lee is another of the fabulous authors that we came across through working with the amazing Crescent Moon Press. Destiny’s Past is the first in the Daughters Of The Crescent Moon Trilogy and after reading Destiny’s Past this is a series we are very keen to follow. The story is set around Kelly and Jarek who first meet in the morgue where Kelly works; Jarek is not the dead body he first seems to be. From the word go there are complications for the couple, Kelly faces an enquiry into a missing body; Jarek’s body technically vanished as he came back to life, Kelly’s ex-boyfriend who won’t leave her alone and who scares her to death and Jarek who has been poisoned and is worried that his brother will be next. The story at first focuses on how to Jarek back to his home land or Leisos. However when things go badly wrong in Kelly’s life Jarek sends Kelly to Leisos and stays behind. While Kelly is in Leisos she has to learn how to help bring Jarek back to his country. The flow of the story was very well planned; I didn’t want to stop reading! I loved the characters; each one had heart and their own voice. However what really stuck out for me was that while I was reading I could really picture the places the story was set in and I could clearly picture the characters. Patricia’s use of description for me helped bring this brilliant story to life. Only one thing left to say: when is book 2 in the Daughters Of The Crescent Moon series due and how do I get my hands on a copy?? On a hot summer day I was in need of something to read. Something that would capture my attention so I could ignore the screaming grandchildren. Destiny's Past accomplished that feat--amazing in itself. Straight-laced Kelly Richards, Medical Examiner, runs headlong into a paranormal world where magic resides. Jarek is our hero, a dead man who claims he's from another world--a prince in fact, of Leisos, a magical world where he rules. Since this is a paranormal romance, time-traveling duo, you know what happens next. One look into his eyes and Kelly falls in love--or lust--whatever it is, the pull Jarek has on her soul is overwhelming. However, someone is trying to kill Jarek so he has to travel forward into the future to find a cure. Then, he'll have to travel back into the past to find out who the traitor is. In the meantime, Jarek has to decide what he wants more. His life or Kelly, the woman of his dreams. Lee is a fluid writer who manages to pull off a time-travel novel without leaving threads behind. (Except the few that will lead to the sequel.) It's a quick read and very enjoyable. I highly recommend it to those with a love of the paranormal! "Destiny's Past" is a book about time travel and the magic powers held by the female line in a certain family that uses this power for good. Kelly, a medical examiner, finds herself caught up in a mystery of time travel and discovers she is a descendant of a very special family of women. 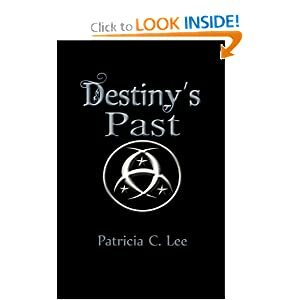 Patricia C Lee's new book, "Destiny's Past", is a fascinating mystery. It stars when Kelly is about to perform an autopsy and realizes the corpse is still breathing! Next she finds out the corpse, Jarek, is from 2000 years in the past. Kelly must then use her medical expertise to save Jarek's life and answer the question, how did he travel to the future and why? "Destiny's Past" is fast-paced and involves the wild romance of Kelly and Jarek. Kelly is not sure she wants to get involved but can't resist the handsome stranger from a different time. This is a wonderful and sometimes steamy paranormal romance you won't want to miss! This book was awesome! I can't wait for the next one. "Destiny's Present" by Patricia C. Lee is the second book of the 'Daughters of the Crescent Moon series'. The sorceress Narena has done a lot of things for Leisos, advised the King, healed a young girl and even sent a Prince forward in time so that he did not die. As if all of that was not enough, she is now being asked to sacrifice even more to protect her people: a sacrifice of herself, her lover or her child. It could be that she has to sacrifice all three. Narena is always on the hunt for those who would threaten the royal family of Leisos and also for her daughter who was taken away from her when the little girl was born. The problem with this adventure? Narena finds out a great deal on this quest: love and hate, loyalty and betrayal and the biggest revelation of all. 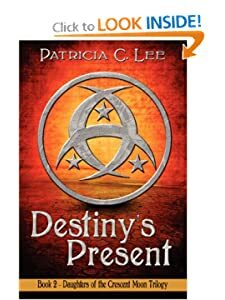 Patricia C. Lee has created an enthralling story with all the characters in Destiny's present. I was riveted to the pages from the first to the last and trying to untie all the little strands of the story as I tugged along on them. I still have some questions, but I like that feeling. Some characters I love, some I hate and some I am not sure what to think of. Ardis the warrior is perhaps the foremost. I am not sure if I like his character or not, but I do know that I want to learn more. I enjoyed this book a great deal and I highly recommend it.